It’s easy to feel helpless and overwhelmed as we’re bombarded with negative news about the damage civilization is raging on the environment and the effects of a warming planet. 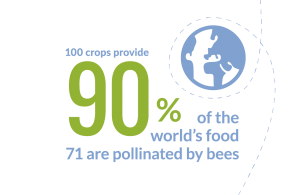 In particular there has been deep concern about the plight of bees and pollinators and this week published research suggests a leading insecticide cuts bee sperm by 40% which is devastating news for the bee population. 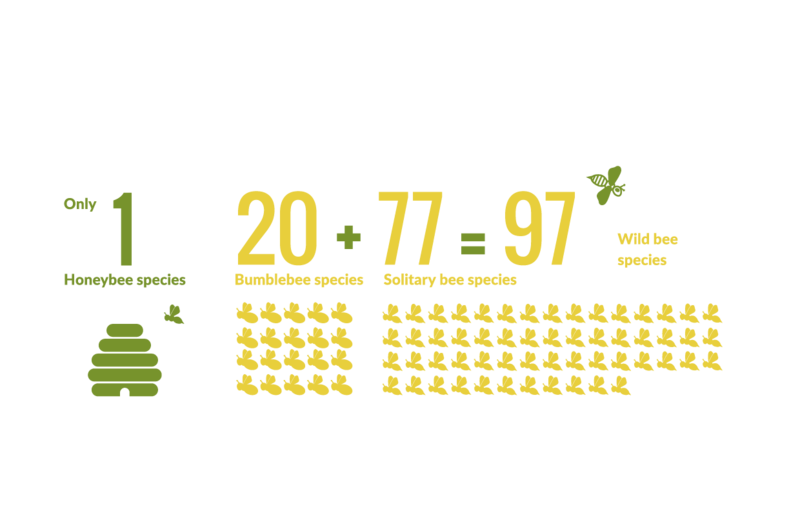 Habitat loss and the decline in wildflowers are subjecting our pollinators to starvation. Our tendency to tidy up the landscape and not allowing wildflowers to grow along roadsides, field margins, and in parks is also playing a big part as fewer of these resources are available. However, there is good news! By making our gardens pollinator friendly we can do our bit to help redress the balance and make sure that we protect pollinators. 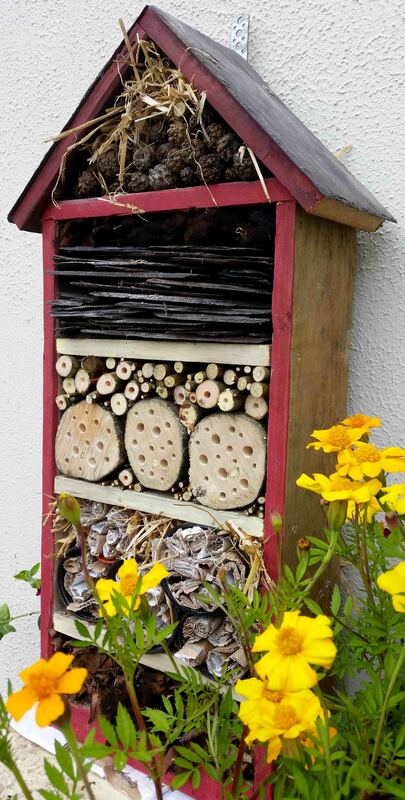 Last year the Biodiversity Centre published an All Ireland Pollinator Plan, followed by a Junior Pollinator Plan and a few weeks ago they increased their resource bank by adding an Action Plan for gardens that you can download here. 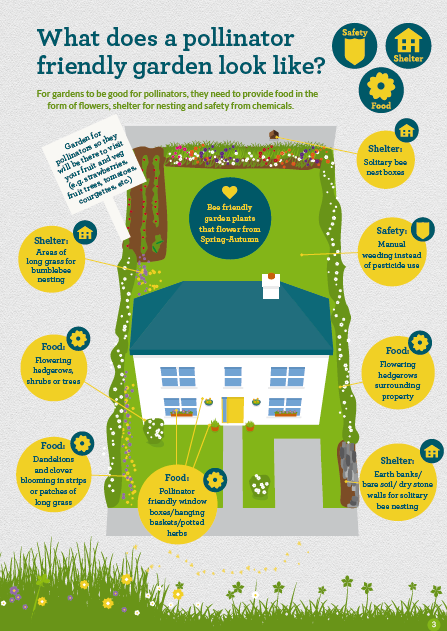 Aimed at anyone who wants to make their garden more bee and pollinator friendly, the guidelines range from very simple to low-cost actions, from window boxes to large outdoor spaces and community gardens so we can pick actions that best suit us. Encourage patches of wildflowers or ‘weeds’ which are food for bees and pollinators. Let hedges flower before they’re trimmed back and allow soil to stay bare on sloping areas for solitary bees. Lawn edging, long grass and dry stone walls all offer shelter for bees and pollinators. 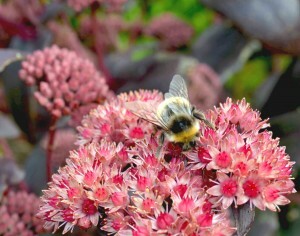 In early springtime, one bumblebee queen needs to feed on 6,000 flowers a day to have enough energy to feed her young! 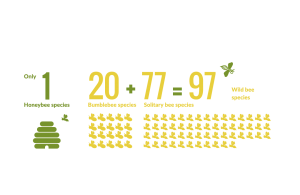 Lawns provide shelter and food for bees and pollinators so reducing cutting can be the most cost-effective way of helping them. That doesn’t mean that gardens have to become wild and unruly; the advice is to not begin cutting until after mid-April when the dandelions have flowered but not set seed. 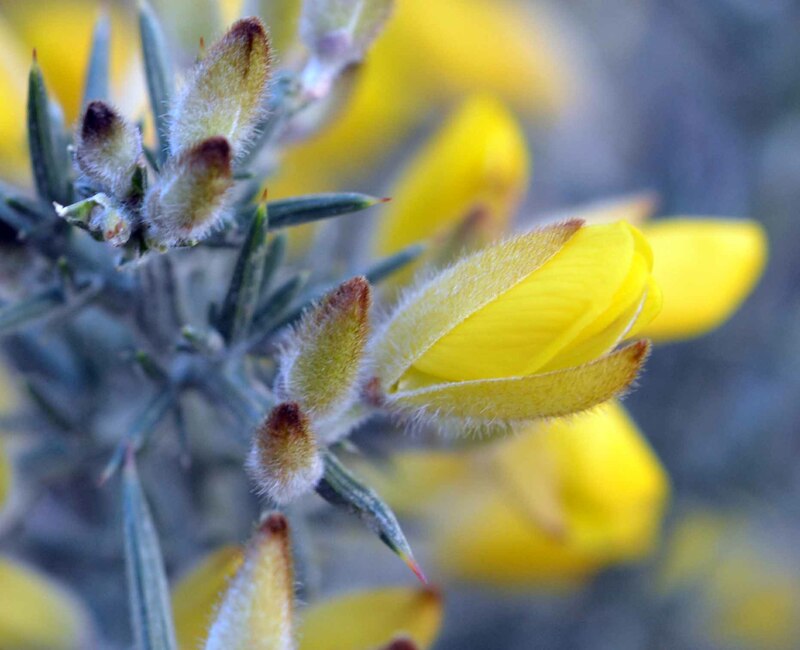 The vibrant yellow flowers are an important source of food as pollinators come out of hibernation. If you’ve a large lawn, consider allowing some of it to grow into a meadow and cut it back in September. Avoid using lawn fertilisers as they promote the growth of grass and not wildflowers. Definitely don’t spray with herbicides. More detailed advice on managing wildflower ‘lawns’ can be found in the Action Plan. I’ve written an article before that shares how bees make honey, but to survive pollinators need flowers that produce lots of nectar for energy and pollen for protein. If you’re trying to make your garden pollinator friendly add plants that will provide these food sources during the out of season ‘hungry gaps’ between October to March and choose single flowered varieties of flowers over doubles, perennial over annual plants. If you’re not sure what varieties to choose, look closely at the flowers in gardens you visit or at garden centres and see which plants the pollinators are visiting. If you’re limited by space, consider filling containers and window boxes with flowers and herbs that bees and pollinators can feed upon such as borage, thyme, rosemary, cosmos, night scented stock and cosmos. Traditional bedding plants such as Geraniums, Begonias, Busy Lizzy and Petunias have almost no pollen and nectar so are of no value to bees and pollinators. 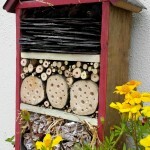 Apart from food supplies, safe nesting habitats are equally as important for bees and pollinators and we can help by providing these in the garden. Bumblebees nest in long grass or abandoned rodent holes. Fifteen out of the 77 species of solitary bees nest in existing cavities and the rest burrow into bare ground or south/east facing earth banks. Simple or exotic bug hotels can be made for bees or just leave hollow stems in the garden such as unpruned raspberry canes for them. It’s not just the birds who like to hang out in hedgerows, bumblebees often nest at the base of hazel, willow, blackthorn and hawthorn so avoid cutting all the hedgerow at the same time and instead cut parts of it on a three-year rotation. Importantly, don’t spray the bases of hedges and only cut them between September and March to avoid disturbing nests. 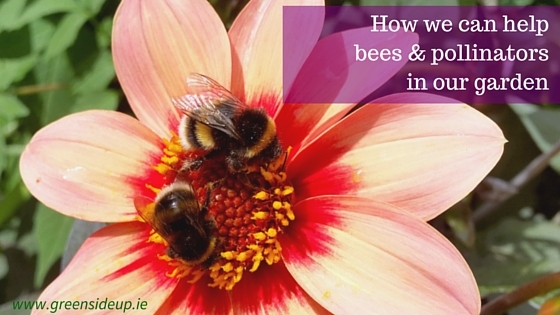 Wild bees are not aggressive so can live safely in the garden alongside humans and pets. ALL pesticides, insecticides and fungicides can be harmful to pollinators, either by damaging their habitats or the plants themselves. 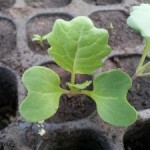 Avoid buying seeds that coated with neonicitinoids (read the fine print on seed packets) and use alternative pest controls such as choosing resistant seeds, barriers and physical barriers. The Action Plan recommends that we DON’T use herbicides on the lawn or verges around our homes and gardens and if they absolutely can’t be avoided, use best practice (read the label). 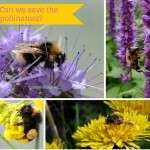 Help to spread the word about how we can help bees and pollinators in our garden. 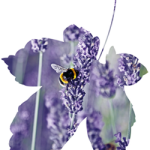 Share pollinator friendly plants from cuttings, seed or division and download the pollinator plans from the Biodiversity Centre and talk about them with your friends, neighbours, schools or community gardens. 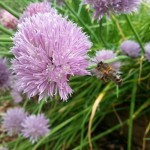 Learn to love bees and insects and see them as our friends and not be frightened by them. 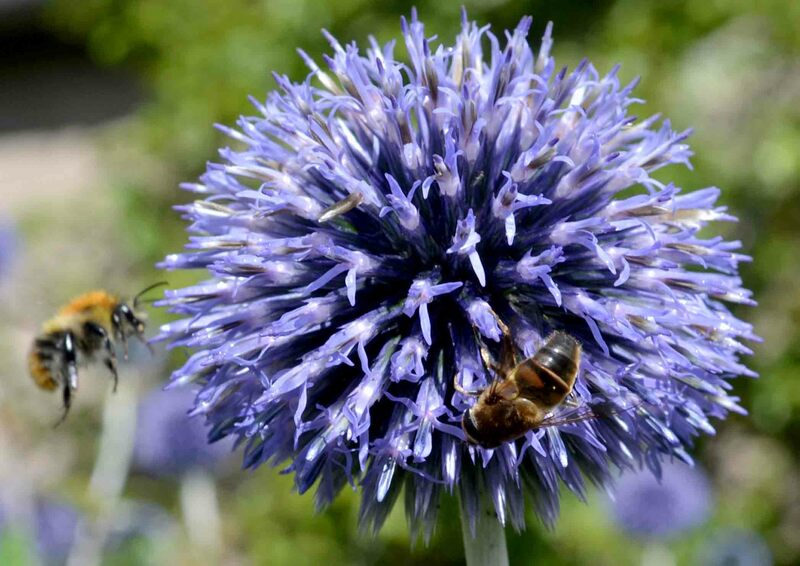 We can make our gardens GOLDEN and log our efforts onto a system where it will track the build-up of food, shelter and safety for pollinators in the landscape in Ireland. To receive GOLD status the garden must give the best shelter, food and safety for pollinators by meeting certain criteria. More information can be found in Section G of the Action Plan. 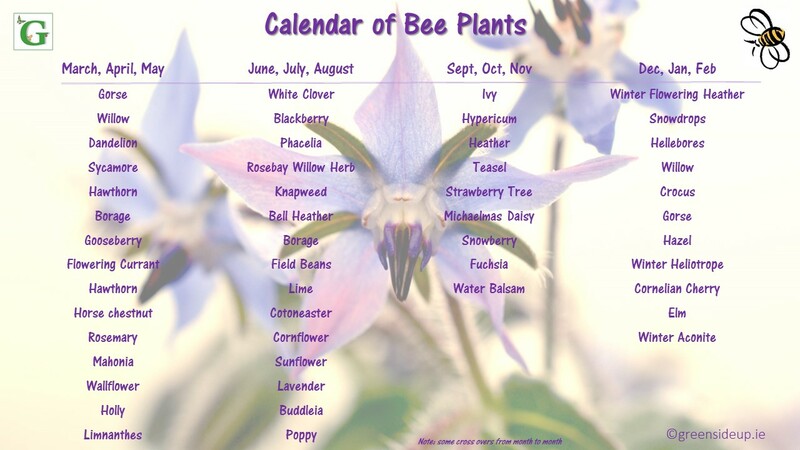 We can also learn to identify pollinators and record which ones visit the garden. 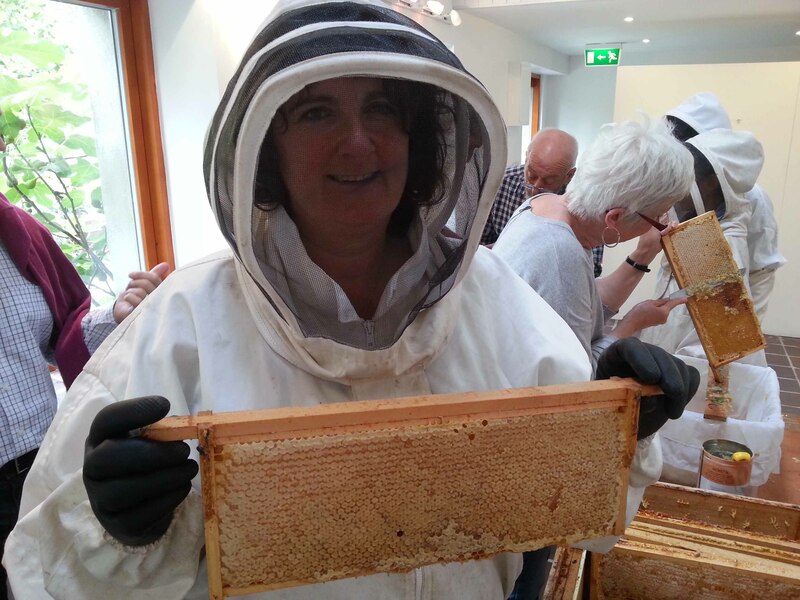 We can become part of the All-Ireland Bumble-bee Monitoring Scheme or attend the various workshops and seminars that are springing up around the country. Greenside Up will be holding a workshop in the Autumn in Gleann na Bearu Community Garden, Bagenalstown, Co Carlow where we’ll be sharing how to build a green roof structure and encourage pollinators into gardens thanks to Local 21 funding in association with Carlow County Council; keep an eye out for the newsletter and/or various social media channels for more information if you’d like to join us. Really great post Dee, there are so many simple steps that people can take but are often unaware of them. Sometimes I despair in our (often) overgrown garden but I always take comfort when I see the bees. Thank you Naomi, appreciate you taking the time to comment. I think people can get too hung up on tidiness so am delighted to see that overgrown and more natural gardens are being encouraged. Really informative article. in our garden in Hungary we are blessed with many bees…we don’t use pesticides and I guess this is one of the reasons the bees visit us. 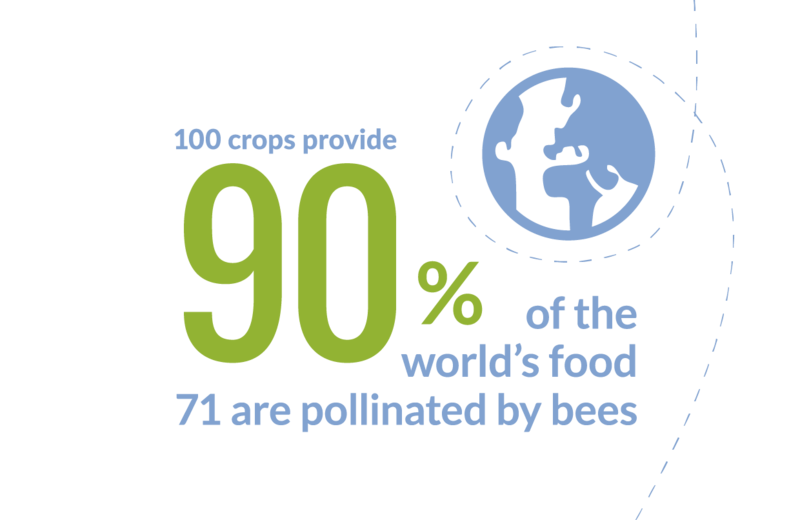 It makes such a difference and all we can do is remain forever hopeful people begin to realise how important pollinators are and stop using them too. Couldn’t agree more. Here’s what I do : I cut the front lawn (taking care not to go near my wonderful totally wild orchids that I didn’t plant), but I never cut the back lawn. That way, the “boss” is happy that the front of the house looks neat and the back, which the neighbours don’t get to see is wild and full of wildflowers. I’d love to plant a lavender hedge but not sure how well it would survive up here in the wind, can imagine it thrive’s for you in sunny France. I’m trying to think about the bees and pollinators in all our planting now, bought a stack of crocus bulbs this morning to make a change from the dandelions. Lucky you with orchids! I too have an untidy garden, at least I know if I’m annoying my neighbours I’m protecting the bees. I love your planting calendar too. I wish I could get more excited about the garden. Sometimes it can be difficult to simply outside when we’re caught in an office a lot. I tend to set myself targets when that happens and tell myself if I work inside until lunchtime, I’ll spend the afternoon or a couple of hours later outside. The number 1 rule of gardening is also handy to remember – start small. A couple of containers planted up now with some Spring bulbs will bring a smile come March.